Rated 4 out of 5 by melissa845 from Starts off easy but later levels are limited moves This game starts off deceptively easy. One starts to wonder if it is really made by Jewel Quest.... then boom.... limited moves... and more and more limited. I ended up giving up around eighteen or nineteenth level. I can do timed much better than limited moves , The saving grace is that one can keep replaying the level until one gets it done. I recommend this game if you like to challenge yourself to limited moves. Rated 4 out of 5 by rainbowtree from Arcade Puzzler I love arcade puzzles, and this one has a variety of M3 puzzles to solve. It is certainly a challenge to earn all three stars. Would have been 5 stars, except for the levels involving a timer. Those are frustrating and not fun. The ending graphics for each level are colorful to watch as the score climbs. Rated 4 out of 5 by s_tickle from Great game, not sure why the bad reviews I'm not reviewing story line or music, that never matters to me. I downloaded and read the reviews and thought, oh shucks, this won't be good. But even with the 1 hr demo, I saw that yes, I like this game. I've played all the Jewel Quest games and with being on level 25 now, I can say that it does live up to the standard of Jewel Quest. What some may find stressful I don't. If they found this game stressful, then I assume they found the other JQ games stressful as well. As in all the JQ games, some boards are harder than others. Sometimes it's a matter of the starting board being just right, so you may need to go to "replay" a few times. I'm a very competent JQ player and this is giving me challenge, which is what I want. It takes a few levels to get used to the different play, or maybe I should say the "items you need" as bonuses. Highly recommend. Rated 4 out of 5 by Kafinkee from Challenging M3 based on demo It's not often we come across a new M3 game that requires a fair bit of concentration, presents us with challenging boards. If you're a big fan of the Jewel Quest series and only want to play more of the same - or if you prefer to just take your time in relaxed mode - you'll likely be disappointed. If you like something new and challenging, please give the demo a try. After playing 10 levels, I decided to purchase and can hardly wait until I get back to it. We are given one or more goals to accomplish in every level; eg, turn all tiles gold and ring a bell 3 times in 30 moves or within two minutes. I'm not a big fan of limited move M3 boards, prefer to be timed, but I do appreciate the variety (depends on my mood). And I haven't yet figured out why I lost a star on a couple of levels. For example, one board required that the goals be accomplished in 30 moves and I did so in 11 moves but lost a star for some unknown (as yet) reason. I've come across that problem before. Why don't developers just tell us when we begin the game! I like having a variety of M3 games to choose from to suit my current mood. I really like to build things, create villages, acquire goodies but they aren't necessities for me to enjoy a game. Sometimes I just enjoy playing an M3 in relaxed mode for some good, stress-free fun and do so quite often (favourites I've played many times include a couple of the Cradle series, Imperial Island, 4 Elements II, Spooky Bonus). Sometimes I really want to be challenged, to have to think about the moves I'm making, how best to accomplish goals and get every star in every level. This one looks like it'll definitely fit that bill but I really hope that when I get near the end of the game, it doesn't become too frustratingly difficult! Story is not at all important to me in an M3 game and this one hasn't managed to interest me but there's plenty of variety and challenge here if that's what you're looking for! Rated 4 out of 5 by brimaz from It's Fun, But...... Is it really Jewel Quest? It's as though it was made by a different developer trying to make it like the previous Jewel Quest games, which I love and have played (all of them) for several years. I've bought it, and trust it will develop as it goes on. It's annoying not to be able to turn the music down in Options, but there's always the volume control on the speakers. Rated 4 out of 5 by cabanaeast18 from Needs building or improvements I liked everything about this game. I really like the story. The graphics are great, including the game board. Degree of difficulty starts early on (level 9?). Some of us fishies like pure m3 games and some of us like more for the time spent matching, not just power-ups, etc. I have enjoyed m3 games when they have some building and/or improvements to shoot for.This is a good match 3 and I recommend it. Rated 3 out of 5 by elderdame from Wish I had given this one a skip I have enjoyed previous games in this series, but if you can't win a level without an immense amount of luck is spoils the fun. I got stuck on level 26 and have been unable to win the level and there is no skip option. Rated 3 out of 5 by charlene_lane from CHALLENGING BUT BORING I completed the first 120 boards on normal mode, but on Expert I only got to 100 boards and gave up through boredom. There are only half a dozen kinds of boards to play. Most of these are collapse modes, limited jewels, timed boards, fill the diamonds, limited moves and some bugs to get rid of. I liked the first 120 boards but I am still furious that the Expert mode had exactly the same boards, except they are harder to play. In past games we had Secret Entrance, Dodge, Strangle Vine, Build, Locks, Climbing, Evasion, Expansion, Cave-in, Pathmaking, Delicate Jewels, Light Fire, Flood, Snowstorm, Electricity, Unbury, and of course our favourite the cheeky monkeys, and so many more boards to play. So what happened? I wished the developers had thought to add some (or all) of these to make the game more exciting. The graphics are okay. At first I thought the boards were too big, but you get used to them quickly. Sound is good, however I had the music turned off. The game can be a bit temperamental and will stop responding in the middle of a game and throw you out. I have now buried this game in the deepest part of the pond, never to be looked at again. However, I still play the older games and try to better my score. Definitely trial before you buy. Rated 3 out of 5 by SynthpopAddict from Too much of a luck factor needed [review based upon completed normal mode] Pros: unique challenges, replayable levels, ability to toggle between normal/expert modes Cons: What happened to the "thinking cap" factor from previous Jewel Quest games? Low quality graphics, clunky play action. 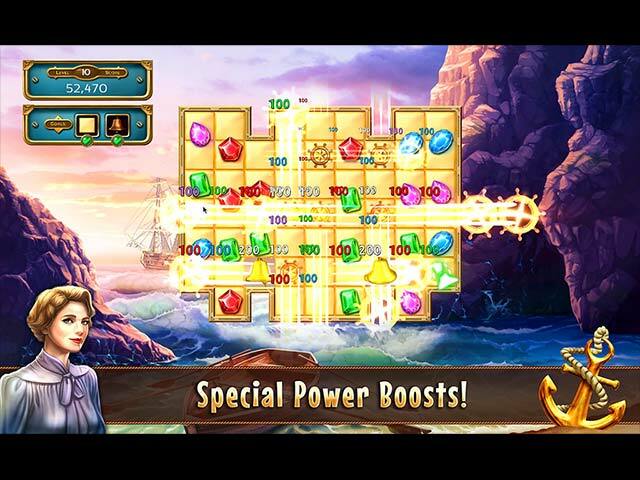 If you enjoyed the challenges of the older Jewel Quest games, the developer brought that back in spades with the latest Jewel Quest. All the levels are either timed or limited moves only. Levels are very small but don't let that fool you...this game is much harder than it looks. In keeping with Jewel Quest tradition, there are also unique features or obstacles which you won't see in other M3s. I enjoyed the storyline, but found the graphics subpar when compared to previous games of the series, and the loud music with no slider to adjust the volume was annoying - shut the music off almost immediately and I usually play games with music on. I also noticed that the play action seemed sort of clunky where I would often be trying to make matches faster than the game would allow. You can make moves all the time, as long as you don't do them *too* quickly. My main gripe with this game is how much you are dependent on sheer luck to win many of the levels; it doesn't matter how good you are but you won't win some levels without a huge dose of the jewels happening to fall in the right way! Normal mode is tough but doable by experienced M3 players but I'm not sure if I'll be patient enough to finish expert mode. I'm not panning it entirely, but won't recommend it either. Rated 3 out of 5 by ritchieprod from Not Precious jewels I love the Jewel Quest series and have played several of the games many times. This new game does not have the beautiful quality we have come to expect. I was excited to see this but didn't even finish the demo. I'll just pull up Jewel Quest Heritage and play that one again. Rated 2 out of 5 by Louisables from OH DEAR! As already outlined by others, not enjoyable at all. Only redeeming factor is I got it for free. Rated 2 out of 5 by Wazbo from Too Much Luck, Too Little Skill Problem solving and logic come into play here, but too many of the levels rely completely on the opening board... get a "bad draw," which happens a LOT, and it matters not how skilled you are, you're going to have to replay the level ad nauseum. 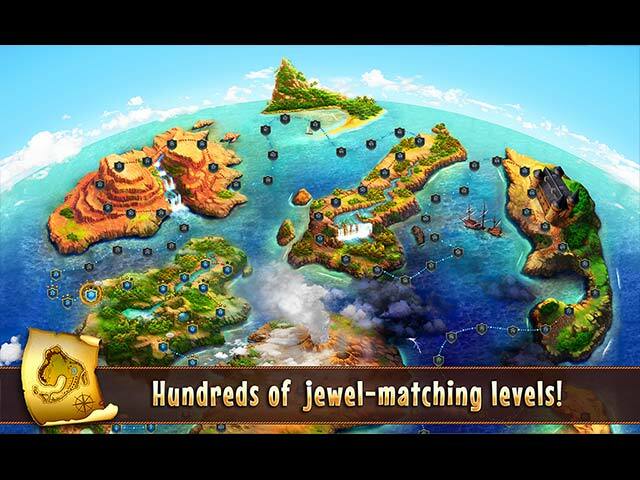 Rated 2 out of 5 by mcs123r from Not impressed with this Jewel Quest I have been very fond of the Jewel Quest games for a good number of years, but, I must say that I am not impressed with this Jewel Quest game. Even though I only played the trial version,I found it very boring and more on the order of the level of Jewel Quest 1 & 2. The developers should put there next games on the order of Jewel Quest lll level. Rated 2 out of 5 by verimeri from cursed house 3 I really dislike games that do not allow you to play in a relaxed mode. I play to have fun not stress myself trying to clear a board in less than two minutes. Enjoyed the other Jewel Quest games but this one is a no go for me. Rated 2 out of 5 by _TheBagLady from Skip Game Unless IQ >500 I really wanted to love it as I do love the previous games. This one could not explain itself to me and I could not read "its" mind! Imagine that! No instruction really for those of us who expected a Match 3 kinda game. I couldn't find a guide to let me know what I was doing wrong, either. I'm an RN with a fair intelligence but truly, this one had me grabbing my Bayer aspirin to avoid the heart attack this games stress level induced! Okay, a bit dramatic but dang, I really wanted to love this game! Rated 2 out of 5 by deddu from Not Enough Choice As some others have stated, this game doesn't give you the choice of a relaxed mode. You have time limits or move limits. The boards are very large for some reason and you have to ring bells (which is annoying for me). And even though you complete the board in the required time or moves you don't always get three stars -- and there is no explanation why. Rated 2 out of 5 by Clydach from Very disappointing Like many other reviewers of this game I have been playing the Jewel Quest range for many years and enjoyed them. So I was pleased to see a new one. However this is dreadful, the graphics are very poor and the red and orange are difficult to tell apart on times. 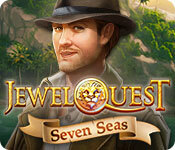 Whereas the original Jewel Quest was innovative and fun this is repetitive and only hovers around average. Not worth spending money one - stick to the early Jewel Quests. Rated 2 out of 5 by TucsonGal72 from Boring Why have match 3 games deteriorated so? The same over and over. The graphics in this one look like they are from years ago. Rated 2 out of 5 by shihtzumum from Jewel Quest?????? What happened to Jewel Quest?....the game that initiated me into the world of internet downloaded games many years ago. I'm speaking of the original Jewel Quest, could of played it almost 24 hours a day. This one looks nothing like the original and even the music is a poor attempt to be part of the series. The first two Jewel Quests are the only ones that shine, the rest should all change their names. I so miss the quality and challenge of the originals. 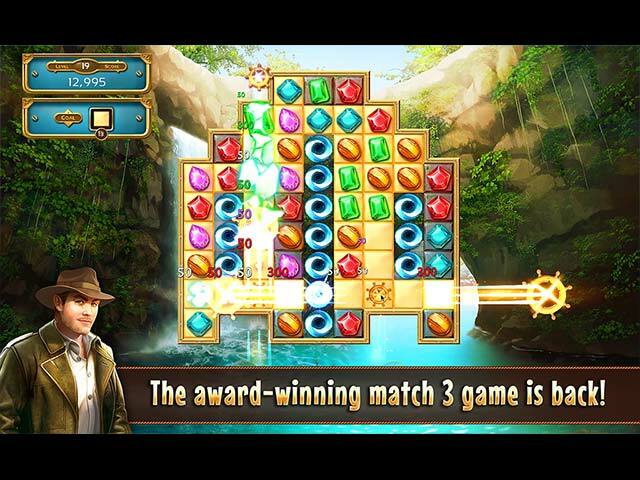 Rated 2 out of 5 by Granny_Gruff from Searching For Story and Solutions! Story lite and impossible challenge heavy, the new addition to the Jewel Board Match 3 games is a no go for me. I have played many of them repeatedly, especially the ones that combine Match 3 and HOP’s. This game, however, turned out to be more stress driven than fun. The challenges start off fairly simple and the story is a line or two under the next jewel board’s intro. The artwork is flat and the game mechanics a throwback to the beginning of this game line. And then you get to level 9. You are to ring bells by creating ship wheels and having them move across the board to ring the bells far over to the sides and in the bottom row. The only way the ship wheels will get there is to place them also in the bottom row – except you have limited moves and the bottom row is single squares with spaces in between. After going through level 9 twice, I realized not only the futility of playing further, but also that I was way more stressed than anything else. I do not play games to raise my stress levels. I’m skipping this Jewel Board and replaying one of the older ones – which, by the by, look as fresh as this one and are relaxing! Maybe one of the Jewel Quest Mysteries! Rated 1 out of 5 by lanotary from ANOTHER JEWEL QUEST BUST Jewel Quest Seven Seas is one of the most asinine games I have ever played. What person in his/her right mind would want to play a board 50-100 times just to get to the next board? That's not a challenge; it's an insult to one's intelligence. I, for one, will not continue subject myself to such abject absurdity. Rated 1 out of 5 by karenmusik from Not worth a free game code I played about 5 levels and deleted the trial. Bell ringing was annoying, can't turn down the music, no choice of difficulty, characters unlikable, plot - if there was one it was forgettable. Rated 1 out of 5 by myyorkies1994 from Not a TRUE Jewel Quest M3 I have to agree with the majority, this game is lifeless! The graphics are very old technology, the story is slim, the changes in game mode of number of moves vs timed, and the unexplained/undefined bonuses all go into making this a zero game. I replayed level 9 about 10 times. It's a limited number of moves and the only way to ring the bell is to get the ship wheel in the space next to the bell. On one attempt I did manage to ring the bell twice, but then ran out of moves. On level 8 a new power up appears that's not explained...there are sparkles coming from your cursor and while in this mode it will break any tile you touch. Takes a couple of levels to figure that one out. The points of not being able to adjust the sound volumes are minimal compared to the other issues this game has against it. Play the original Jewel Quest games and enjoy them over and over. This one is for the scrap pile! Rated 1 out of 5 by SrRat from So Disappointed This game does not match up to the basic Jewel Quest, let alone the subsequent releases. I have most of the JQ series but I'll pass on this one. If you know the Jewel Quest line, you will see what I mean. If you have never played, I suggest you download the first or second Jewel Quest and skip wasting your time on this mis-named game. Rated 1 out of 5 by MsReddFox from No Go I didn't try this game for very long. I quit on #4 or 5. This just isn't the kind of match 3 game that I like enough to buy. The deciding factor was that it's timed, no relaxed to play. I also don't like playing the board where you can only play with x amount of moves. I also like match 3's that you can build things, or decorate. This game has none of those things that I like. Sorry, but this game is not for me. Rated 1 out of 5 by mrm2006 from Too Stressful for Me! Hello Everyone! I love a good match 3 game just as much as the next person . And I did enjoy playing this game .... for about half a minute. Things I Enjoyed: * Graphics were nice. Things I DID NOT Enjoy: : * No choice of difficulty or type of game (i.e., move limits, relaxed, timed, etc.) * Music and Sound could be turned ON or OFF but not turned down. * No explanation of why I was only getting 1 or 2 stars instead of 3. After all, I completed my goal for that level. * If I DID NOT meet my goal for a particular level, I had to 'retry' until I did. There is no option to just give up and move on. * No discernible bonuses to help you along ... like bombs, etc. Each level had a goal .... ring the bell and turn all tiles gold in 2 minutes ..... (there is a LOT of bell ringing in this game) .... turn all the tiles gold and get 3 midas touches in 2 minutes ...... do whatever in a limited number of moves ..... etc., etc. If you like playing with a gun to your head (so to speak) trying to make what to me were sometimes impossible goals, then this game is for you. If you just want a relaxing game of match 3 ..... give it up. I lasted through to level 9 and after 'retrying' half a dozen times ... and my head starting to pound ... I gave it up and uninstalled. As to 'hundreds of levels' ...... I saw 120. ENJOY!